Twelve page issue of the student produced newspaper. Includes the Catalyst Entertainment edition. The Catalyst Entertainment page 5 -Mike's Movie Pick page 6 -Movie Times page 6 -HalfLife page r o 7 -DAY WEATHER Today: Partly Cloudy, 85/70 Thursday: Mostly sunny, 84/7 0 Friday: I alated T-Storms, 8JI67 Saturday: Partly Cloudy, 8z/67 Sunday: Scattered Showers, 8o/65 Monday: Partly Cloudy, 8o/6z Thesday: Partly Cloudy, 79/61 ALL ASSIGNMENTS Friday: Julia Davis "Superhero Wall" Saturday: Daina Crafa rhe CATALYST GENERAL miTOR Michael Gimignani MANAGING mrTOR Sarah Zell DESIGN mnoR Caitlin Young COPY mrTOR Whitney Krahn PHOtO EDITOR Nathaniel SENIOR STAFF WRmJlS Abby Weingarlen Michael Sanderson STAFF WRITERS Christopher Defillippi Maria Lopez Katelyn Weissinger JoshOIT Sarah Stamper Erin Marie Blasco The C'..atalyst is an academic tutorial sponsored by Profe sor Maria Vesperi. It is developed in the ew College Publications Office using Adobe Photoshop and Quark Xpress for PowerMacintosh and printed at the Bradenton Herald with money provided by the New College Student Alliance. Direct submissions and inquiries to: The Catalyst 5700 Tamiami 11:. Box #75 arasota, FL 34243 cataly t@ncfedu (941) 3594266 The Catalyst reserves the right to edit submissions for space, grammar or style o anonymous ubmi sions will be accepted ce contribution guidelines for further information All submissions mu t be received by 5:00 p.m. Saturday in order to appear in the following week's issue. Information about upcoming events is welcome throughout the week. Visit The Catalyst online at: h :1/studentweb.ncf .edu/Catalyst ON CAMPUS March 19, 2003 by Katelyn Weissinger Professor Sendova wins National Science Foundation grant New Colle g e Physi c s Profe ssor Marian a Sendova wa s recently a warded $4,500 by the N a ti o nal Sci e n c e Foundation to promote r e s earch partnership s with foreign universities The Collaboration in Basic Science and Engineering, a program funded by the foundation, provided the grant. The money allows a Bulgarian physici t, who is a friend of Sendova's, to do joint research with her over the ummer "This is an extension of my work," Sendova commented on the research. ''This i a stepping point for writing a proposal for a larger grant.'' Sendova also hope the grant will help to establish reJationships with foreign institutions like the Bulgarian Academy of Sciences. Novo Collegians celebrate their bodies witt1 artsy activities Last week was Body Image Awareness Week. The celebration was hosted by three Resident Advi ors: Veronica Fannin, Eric Sosnoff, and Emma Jay. The Body Image events provided several arti tic outlets for bodily expression including a session where students made their dream T-shirts. "We started with XXL for everyone so that no one had to be put in a box and so that shirts," Jay said. She saw Body Image Awarene ss Week as a way o f "heightening awarene s that there are a lot of different body types on campus and different people are comfortable with different parts of their bodies." Other events included drawing chalk outlines of bodie a figure drawing session, a bike ride to Lido Beach, and a body-tbemed open mic at The Four Winds Cafe. Film festival questions masculinity in America This April marks New College's first-ever Masculinity Film Festival. The festival will show ten movies presenting and challenging the concept of masculinity in the movies. The festival is hosted by students of Professor Andrea Dimino's American Fiction, American Culture class. "Movies have given us some of our most powerful images of American masculinity," Dimino said. "I'm thinking of strong, silent John Wayne hunting for his niece in The Searchers, Humphrey Bogart making sardonic wise cracks in The Big Sleep, and Marlin Branda in the Godfather movies loving his wife and his sons and running a crime family with an iron hand." The films in the festival include several genres and time periods, from Ferris Bueller's Day Off to The Royal Tenenbaums. The movies will begin at 9 in the Hamilton Center Teaching I nnerarity/Neu Second-year Brian Ellison won the title of "Sexiest Slave in the Empire" at Saturday's UnderwaiVDecline and Wall of the Roman Empire. Auditorium every Wednesday and Thursday night in April Women's History Month The Diversity and Gender center is hosting several events to celebrate Women's History Month this March. Diversity and Gender Coordinator Tashia Bradley said it's important for women "to are." Bradley says there are still people wh o believe a wo man's place is in the home and she hopes tha t W omen's History Month will help educate people about women's rights. The center recommends the book Do They Hear You When You Cry by Fauziya Kassindja and Layli Miller Bashir for spring break reading. The book documents the struggle of a woman seeking asylum in the United States and deals with controversial topics such as female genital mutilation. An "If Women Ruled the World Dinner Party" is scheduled for March 31. Those invited include United Nations personnel. a World Bank employee, prominent lawyers, and several New College alums. The party is intended to facilitate discussion between these women and the New College community, as well as to celebrate their accomplishments. Dorms dunked in dartmess When the power went out at just after midnight on Feb. 15, raucous hooting erupted from all of the Pei dorms. Within minutes, students flocked to Palm Court bearing candles to converse and assess the situation. After about fifteen minutes and the passage of the initial confusion, Palm Court swelled with students, flashlights, and candles. Everyone seemed eager to accept the blackout as a divinely imposed study break. The Campus Police announced to a cheering crowd that F1orida Power and Light had told them "at least two hours" as an estimate for the return of power. "For reasons with I cannot explain, this has made me happier than I have been in a long time," said second-year Ben McCormi5! ': of Campus. The Airp o rt, Shell and b uildings on the We s t Side of c ampus were n o t affected. In th e Dort and Goldstein residence haUs, emergency lights remained on, powered by a generator. The Pei dormitories and Hamilton Center are not equipped with emergency generators Within a couple of minutes, a drum circle had formed in the center of Palm Court, and along the peripheries, members of the Celtic Music Ensemble could be seen gather their instruments. Soon several students in coin belts began belly-dancing to the music. Tom Buddleworth, a visitor from Albion College, was surprised at New College's reaction. "[New College students] stepped outside and stopped what they were doing," he said "We just go on with our business as usual. The fact that they all carne out here .. .I think it's pretty cool." "Obviously, this whole power outage is a preview to the apocalypse," explained second-year Sam Holland. The apocalypse did not occur that night, however, as the power returned at 12:49 a.m.-not exactly the two hours Florida Power and Light anticipated. Students lingered in Palm Court until after 1:30 when the drum circle was broken up by the Campu Police after a noise complaint. Staff writers Sydney Nash and Chris DeFillippi contributed to this report. t NEWS March 1 2003 Inevitable problems with diversity are sfll problems b y Nathaniel Burbank campus is undermining the stated goals of As May 1 approaches the day the institution. "A an honors college I students around the nation must decide just don't understand how we can justify which college offer to accept-New that this is exceptional, given our lack of College Admissions has yet to enroll a ethnic diversity," she said. single African-American student. Out of Admissions has never officially used 36 African-American students who have race as a factor when it considers applied so far, ix. ha\e been accepted but individual prospective students, but it is none have signed up to be here this fall. able to consider certain socio-economic To many, this fact ymbolizes the factors, uch as a candidate s status as a problematic homogeneity of the New first-generation college student. College community Just as a unified Financial Aid and Admissions Director definition for veganism seems unlikely to Joel Bauman was quick to point out that grace this campus anytime soon, forrnllig Admissions considers each candidate a consensu on a j u st and fair route for individually. 'We look at the whole dealing with diversity is tantamount to person in our review of a candidate, what impossi ble. New College Admissions is you are not allowed to do is give strung between ideology and reality, what preference," he said. is best fo r the insti tu tion and what is legal, Efforts to achieve diversity through as it attem p ts t o craft a community of targeted ethnic minority recruitment have stude nt s w h o are both strong increased in recent months. At the request aca de mically an d diverse. of students, the President's Enrollment ''I am p articularly concerned with our Committee has been temporarily pro blems enrolling African-American transformed into the ad-hoc Diversity s tudent s," said New College President Committee with four sub-committees: Gordon Michalson In a s ta te as diverse F aculty and S taff R ecruitment, Curricular as Florida I think it is v ery prob lematic Enrichm ent, Stud e n t R ecruitment, an d that we are not more rac i ally diverse. Campu s Atm o s phere and S tu dent Diversity and Gender Coordinator Retention Initiatives such as the New Tasbia Bradley echoed these sentiments College Multicultural Scholars' weekend on along with a myriad of speakers, 2003 (ongoing) Ethnicity Applicants Recen t Enrollment (sorted by ethnicity) Admitted En rolled Ethnicity performances, and workshops have been New College is with the created to increase recruiting successes plights of many educattonal institutio n s and deal with diversity issues on campus. facing similar problems, especially in the These alterations have yet to result in state of Florida. Of only 2.06 percent of drastic changes in enrollment of underAfrican-American Floridians who took represented populations. "I am being the SAT last year, less than 300 students robbed of a better academic or even scored above average fo; social experience, because of the lack of New College adnusston. Competition for diversity," said Audrey Nicoleau a high petforming highchool students second year African-American student from under-represented populations is who is a member of the Faculty and Staff fierce. Recruitment committee. More students Nicoleau feels Admissions' s t rong from under-represented populations "can emphasis on SAT and ACT scores during only enhance the discussion," she said. the admissions process is not help i noto Michalson echoed statement in a boil? a more diverse campus. "Maybe0not Feb. 11 guest column m the Sarasota puttmg so much emphasis on SAl's and HeraldTribune. "In principle, a void [in picking up on the essays," she said diversity] is just as problematic as say a recalling that New College void in history or mathematics courses," previously required four essa y s of he wrote. applicants. Second-year Steve Scott agreed with Associate Admissio ns D ir ector Scott this sentiment, but took a broader B riell claimed the heart of the problem perspective. ''Every element of [New with enrolling e thni c minorit i es is College] society, class, culture, re li gio n recruitment. 'The s chools that we are politics, diet, it all needs to be varied." competing with bas i call y have double the Scott believes that the insti tu tion's thirst [recruiting] budget pe r s tudent, he said. for diversity should not be limited to B riell explained tha t many of our private e ncou r aging more ethnic minority as p irational peers will fly prospective enrollment. W e need m ore id e as, more s tudent s from under-represented viewpoints. I think this is fundamen tal to p op u l ations to th ei r campus from around a liberal arts education," he said. the country and treat them to aUexpenses-pai d campus visits. New 2002 Applicants Admitted Enrolled Asian Pacific Islander 29 1 1 0 Black (not Hispanic) 34 Asian Pac i f i c Islander 38 17 7 College is c urr e n tly able to offer $250 travel s cholarships to prospective stude nts with demon s trated need. 'We are ttying s o hard as i s e very other school i n the cou n try to increase diversity, Briell s aid. 6 0 Hispanic 67 28 5 Multi-Ethnic 3 1 0 Native American 2 0 0 Other 7 3 0 White (not Hispanic) 383 230 61 No indication Given 35 11 1 Black (not H i spanic ) 48 8 1 Hispanic 65 23 12 Multi-Ethnic 1 1 0 Native American 6 2 0 Other 1 0 0 White (not Hispanic) 539 313 170 No Indication Given 10 6 2 E i .. thn c are self reported b} candtdates. Comp1led by Aeu College Admissions To date more Hi s panic s tudents have alr eady app lie d for thi s year than during the entire admi ss ion s c ycle las t year. Briell credi ts both better recruiting efforts an d the rel oc a tion of Admis s ions Cou n selor Brad Bryan who i s bilingual, to the s outh Florid a area. 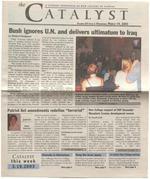 CATALYST nt a volume xvi issue 6/3.19.2003 me Semi Nonnl Something normal? At NCF? Say it wasn't so! page 7 These old Bones will soon be lad to rest New College, unlike many Of Florida State University System, has very few organized and competitive sports. This will become even clearer on May 18, when the Bones, New College's long-running men's softball team, will don their gloves and protective cup for the last time. The Bones, playing this year in the Sarasota Area Softball Association's "D" division, date back to the summer of 1985, when pitcher and Economics Professor Rick Coe grew hungry for competitive sports. "[First baseman and Philosophy/Religion Professor] Doug Langston was the other original faculty member on the team. We were 0-10," he said. Their misfortunes changed quickly. On Sept. 15. 1985. shortstop and then-Director of Student Affairs Mark Johnson's wife Lauren gave birth to their son Matthew, just prior to the Bones' first-ever victory. According to Lauren Johnson, a Bones fan ever since that fateful afternoon, her husband ''took cigars to the ball park. He was impressed that he was Unfortunately. only one current student, center fielder and third-year Ty Ryba. plays for the team now. "It' lonely out here," he told The Catalyst. The lack of tudent interest is one of the major reasons for the burial of the Bones, which lost a number of students in the past few year to graduation. "It was always a mix of youth versus wisdom." Lauren Johnson said "Now, it's more wisdom than youth. Go youth!'' she yelJed at Ryba. Despite lack of student participation. the Bones soldiered on into this season with an eclectic mix of faculty and alumni. In addition to Langston and Coe, Religion Professor John Newman and Psychology Professor Gordon Bauer take the field regularly. "We used to be able to piece together a team for the summer. It' not that hard to play this game," Coe said. The Bones play in a slow-pitch softball league, where the ball mu t be thrown underhand at an arc of three to ten feet, and games are limited to New College Bones: The Final Season All games are Sunday at 17th Street Park March 23, 5:45 pm Opponent: Apple Plumbing March 30, 3:15 pm April13, 5:45pm Opponent: Designer Marble and Granite Opponent: Done Wright Pest April27, 4:30pm Control Opponent: P.T. 's Sports Bar AprH.6, 4:30 pro Opponent: W.P.l. thy 4, 5:45 pm opponent: Monogram May 11, 8:15pm Opponent: Holy Cross Lutheran May 18, 5:45 pm Opponent: Shelley Carpets Playoffs and Rainouts TBA after the game," said photocopied schedule provided to The Catalyst, 'Bones Beer Man' was handwritten next to several dates -a clue to just exactly what the team does after games. ''They're out there for hours. In the rain. Sometimes, I come back after midnight, when they close the gates, and they're still there: Residence Life Coordinator (and longtime Bones fan) Lindsey Dedow told The Catalyst. Coe would love to see more students come out, at least to watch. "We practice every Thursday night on the field next to Dart," he said. ''Come out everyone, start practicing." Although Coe said it was unlikely that new players would be taken on this late in the season, students interested may contact him at coe@ncf.edu. Coe even hinted that the Bones weren't quite wa hed up yet: "I hear the new Political Science professor, Frank Alcock, he's an ex-baseball player. You never know." The Catal t NEWS March Low s udent turnout for Peace Corps presen ation Nathaniel Burbank!Cata. (yst Regional Recruiter Adrienne Fagler who volunteered with Peace Corps in Russia, speaks to a student about the Peace Corps by Christopher DeFillippi "This is wha t I call a real-life graduate educ at ion," was one testimonial p r e sented by a Peace Corps member in a recruitment video, kicking off a Mar. 6 presentation attended by roughly 15 people, including three ew College students. Showing images of healthylooking, smiling voluntee rs and at least smiling foreign civilians, Afri c an tri b al music played continuously in the background as the video presented some of the locations where volunteers are deployed. The same music played on as scenes of Ghana and Nigeria faded to shots of Russia, Central America, and central Asia, but the audience did not seemed phased by the incongruity. Adrienne Fagler, the Peace Corps regional recruiter who was running the pre, entation, fidgeted uncomfortably when the video howed a volunteer in Nigeria speaking of how he really had to crape by' on his Peace Corps stipend for a couple of months.Fagler addressed that volunteer's comments after the video presentation was completed. "I was getting by fine with the money Peace Corps gave me," Fagler said of her Peace Corps term in Russia. "I don't know what his situation was." Created in March of 1961 on executive order from President John F. Kennedy, the Peace Corps was intended to function as an organization of volunteers dedicated to the ideal of international cooperation, understanding, and peace. Administered by a presidentially-appointed director and de p uty director (Gaddi Vasquez and Josephine Os1en respectively), the Corps deploys volunteers to imp overished or pre-industrial nations upon the request of their governments. Under this organization, volunteers spend three months of training and two years in their host countries engaged in educating civilians, community building projects, agriculture, irrigation, or medical work, depending upon their individual skills and background. Before getting into many more of the particulars, the regional recruiter preceded the question and answer session with a game. "You wake up, you're in a Peace Corps country, by the way, and you want to climb Mount Everest," Fagler began. "Where are you?" "Nepal!" answered Career Services Coordinator Maria Juhasz enthusia tically. After Juhasz claimed the prize of a Peace Corps key chain, Catalyst photographer and second-year Nathaniel Burbank: correctly identified South Africa as a locale in which one could swim in both the Atlantic and Indian Ocean. When the game was over, Fagler took question from the audience. She confirmed that while in the Peace Corps, tudent loans can be deferred up to three years. Aware of the Corps's prohibition of entrance for tho e who have been employed in federal intelligence agencies, a middle aged gentlemen was reassured that his record for merely applying for work in the CIA would not deny him admittance. An elderly woman with experience as an actre sand singer and a master's in French was assured that a background in the humanities is not necessarily less valuable to the Corps as experience with the natural sciences. The attractive benefits to Peace Corps volunteering Flagler expounded upon included the Peace Corps Fellowship, a program that assists in students get into and pay for graduate school. Also, for one year following work in the Peace Corps, volunteers are granted non-competitive status for any type of federal work, meaning Federal officials give their applications extra attention, and Corps volunteers are given if all other factors; For more information regarding the Peace Corps, visit http:/1-'Ww.peacecorps.gov Semi-orml welcomed back after two-year hiatus by Sydney Nash Several hundred Novo Collegians followed a candle-lit path to a transformed College Hall for last Saturday's Semi-Nonnl. Students walked briskly across campus, despite the pain of high-heeled shoes donned for the semi-formal occasion. College Hall, the bay, and the partygoers themselves, were decked out in true Great Gatsbv fashion. The fireplace in the entrance "lounge" was decorated with blue vases filled with arrangements of red carnations. Blue tablecloths and silver and blue balloons offered a touch of formality to the "Blue Ball." Formally-dressed students and visitors lounged on the lawn between College Hall and the water; and green lights were even visible on the far side of the bay. (The Catalyst later discovered that the lights in question originated from a Longboat Key bridge.) The Music Room wa disguised as a dance club. Many kicked off their shoes to dance on the wooden floors. Designs of colors and shapes moving to the time of the music were projected on one wall. As the night wore on, people began to enjoy making shapes with their shadows as they waved their hands and bodies in front of the projectors. Although the dress code was officially "semi formal," not everyone followed the rules. Some expanded the definition by cross-dressing, others donned less conventional choices in formal wear, and some did not dress up at all. Third-year Amelia Bird was spotted wearing a short blue skirt with a plastic swordfish stuck on her chest with double-sided duct tape. The outfit was completed with pigtails. "I'm semi-normal," she said. "This was my interpretation of the dress code.'' Second-year Dania Trespalacios was dressed as a can-can girl, complete with a low-cut blue dress, feathered hat, and fish net ''I'm the commercial for Smirnoff Ice,'' she said, posing with a Smirnoff Ice bottle. A conflict resulted earlier from a mix-up at wall sign-ups when former Equipment Room Teaching Assi tant Erin Rodgers had not received the list of special events, including Semi-Norml, in order to block off the dates. The conflict was resolved by having Blue Ban end at around 2 a.m. and second-year Devon Barrett's funk wall begin around the same time in Palm Court. The compromise between Barrett and Blue Ball organizer and frrst-year Sarah Stamper appeared to have been a success, as much of the crowd from College Hall found their way back to Palm Court in the later hours of the rooming. Several students began vocally advertising for the Funk Wall as 2 a.m. approached. The New College Police assisted by givmg some partygoers rides back, and others walked the long way back across the overpass. Nathaniel Not what Charles Ringllnc had In mind: jello shots and plastic swordfish highli&ht party. The Catalyst PERSPECTIVE Beware, the Sanderso F: ctor is on Is Provost Callahan derelict in her re ponsibility to the student lxxiy? We'll analyze the sttuation. Caution: You're about to enter a nospin zone. The Factor begins right now. I've had occasional dealings with Provost Callahan. I respect her for her work on accreditation. But I feel she's bungled the creation and management of the smdents@ncf.edu list. I'm not against a list. I'm not against a mandatory list. I'm against a mandatory Jist that has no purpose, no oversight, and no policy. With her thoughtlessness, the good provost has single handedly sullied the oncepleasant expetience of having an ncf.edu e-mail address. The good provost probably didn't intend to require all students to receive any random political message amid our messages from friends, professors, and (very occasionally) the admini tration. But whatever, no one knew what she intend d wb th ght up this policy. Anarchy rules.! Anarchy fed by adminis ration-mandated participation rules the most! Provost Callahan, I want off this list. Everyone else who wants off should get off, too. Now. Before the mas of people who asked us for rides to the Tampa airport before spring break: ask again for rides back. You didn't intend the current situation, so don't try to stand behind your mistaken policy. Don't give us the plea that the administration needs a way to "conveniently" communicate with students. Don't tell us to be patient while possible solutions are tried, undoubtedly starting with the easiest, most convenient, and most timid. For almost a year now this annoyance has been flaring and festering. I've saved some great examples, which I'll post to The <;atalyst web site if anyone would like to browse them. The list is a disgrace, consideting how useful It could be if run right. Anyone who's ever put on an or lost something of 1mportance or entimental value knows there are reasons worthy of taking a moment of all of your fellow students' time. Good, decent people sense the Jist can be useful but can't use it without associating themselves with the most obnoxious elements of our society. The problems are especially unnecessary because when the compo eel In the absence of natural limits, the broadcasting aspect threatens to overwhelm the interpersonal aspect of e-mail, and we should resent that. Maybe if the administration put some effort into organizing the ncf.edu web ite-using it to provide useful resources for current tudents, in. tead of the useless mess it is now-administrators and staff could stop complaining about the big problem of campus communication. Students-through Student Affairs and the NCSA-have a role t? play as well. Newcollegerides. Slgnmyguestbook.com-it 's not hard. But no one feels responsible and so nothing Michael Sanderson gets done-the New College way. OPINION Students' postings barely outnumber those of a Provost Callahan has bungled the existence of the students@ ncf. edu list. handful of high-priority posting-most also under the authority of Provost Callahan. Her responsibility for academic activity makes her doubly responsible for the despicable, obviously inconsiderate practice of experienced the same problems, and the NCSA proved responsive. A moderator was appointed, policies clearly articulated, and the listserv became the pleasant tool we deserve. The administration ruined the accomplishment with the new email server, which wouldn't send or receive listserv messages. The current list should be thrown out, and a listserv recreated with the adminstration 's resources and the active involvement of the NCSA. Not only inappropriate posts contribute to the problem. For most users, e-mail is an interpersonal medium, not a broadcast medium. The analogy with snail mail only goes so far, because a) there is no cost of paper or postage, and b) messages instantly can be sent to everyone the moment they're members of specific classes. Maybe she could employ pre21st-century communications and go downstairs in Cook Hall to let the Humanities Division know that not every New College student needs to know that a particular class of 10 or 20 people has been canceled or moved. If not, she needs to state explicitly that it's acceptable and instruct the Social Sciences and Natural Sciences divisions to do the same. Director of Campus Computing Duff Cooper said he's looking for $500 to buy some proper listserv software. At this point we need any kind of solution, but it would be outrageous if students end up paying $500 when the administration wrecked our own solution and then re-created the problem for us. LE II ER TO THE EDITOR had been announcing an upcoming Pro-choice support rally, which I had been helping to organize. I spoke to help clarify the purpose of the rally and also to encourage student to attend; it was at this point that I made the comment regarding New College being a ''liberal campus." I had not meant to imply that all students at New College were liberal (as in a political affiliation), but rather I used .. liberal" to mean open, in the respect that New College 'tudents are open to hearing a variety of perspectives. In this case, I meant open in that students would consider coming to a pro-ar Editor, I am writing in response to Nathaniel Burbank's 'Opinion: New College is an 'open,' not 'liberal,' ampus society." While 1 agree with the basic sentiment f the article, Mr. Burbank incorrectly quoted Maxeme uchman. Mr. Burbank, who was not present at the own meeting. cited Ms. Tuchman as calling New ollege a "'liberal campus,.,, which was not a comment hat Ms. Tuchman made. At the town meeting. a student March 19, 2003 LETTER TO THE EDITOR To the Editor, In the March 12th issue, Scott A. Briell wondered what I meant by "need-based admissions". Let me clarify. The opposite of admissions implie: that you are admitting students who don't need a 1 ew who don't deserve a 1 'ew College educatiOn. Yes, With under such an interpretation, we are both co;rect. We need more need-worthy student<>, and we don t currently have enough of them. We need stronger needs-based scholarships, which means diverting funding away from merit-based scholarships. Notice that of all the scholarships that are adverttsed on the 1 C web site (National Merit, 1 rational Hispanic Scholars, Presidential. Provost, and Dean, Bright Futures, Talented Twenty, and the NC additional bonus when Talented Twenty is earned with Bright futures). NONE OF THESE ARE NEEDS-BASED SCHOLARSHIPS. And the general scholarships, who is awarded those funds? And the NCF general cholarships, who do they favor? Students with academic achievell_lent, intellectual promise, leadership ability and a commttrnent to community service." Read: school sponsored extracwriculars and Boy Scouts. Rewarding those who have been pre-groomed on a college track is not a race and class-blind policy. The system encourages rich students who could afford the testing process, who came from well-to-do neighborhood schools that tracked students towards for an AP/lB curriculum. The non-privileged were tracked elsewhere and thus they were discriminated against. These scholarship policies only perpetuate the white hegemony on can1pus by financially favoring the pre_to come to college, discouraging d1amonds-m-the-rough that would expand the wor\d. institution. we have a reBjpoosib.ili(y. inexpensive education to all who can handle our intense, independent education and can also contribute to the community. We can still be academically rigorous without catering exclusively to the privileged. who happened to live in the right neighborhood and could afford to take expensive tests. After all, if ffi, AP, and junior college grades can't transfer over in the academic world, that implies that HIGH SCHOOL EDUCATION DOESN'T COUNT. It is only an indicator used as a way to filter out those who aren't New College material. But with only 72 percent of the clas of '96 graduating, maybe test scores aren't the best indicator of potential performance. I can assure you that an m diploma is only one of many factors that determine if a student is New College-compatible. Say what you will about how the admissions process looks at 'the whole when it comes to scholarship the only indicator that matters is the SAT score. Our school does not monetarily encourage the needy. Steve Scott choice rally. I realize that the phrase "liberal campus'' could have been misinterpreted and I apologize for not choosing my words more carefully. I have never thought that all New College students were "liberal" in political affiliation or that all were pro-choice. Again I apologize for my word choice and I would hope that future Catalyst opinion pieces include only confirmed comments. Corey Callahan The Catalyst regrets the error, ami apologi4.es for the misattribution of Ms. Callahan s worcl\.